Magic is dangerous–but love is more dangerous still. World Building: Amazing! Nothing beats a London setting, and the mix of elements here was just brilliant. 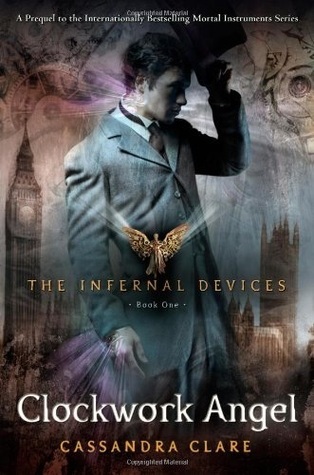 Loved everything, the creatures, the magic, the steampunk elements, it was amazing. Characters: Brilliant work, Tessa, Will, Jem – they were all just brilliant. Super charismatic, unique voices, strong characters and development, they made sense through and through. Brilliant work with the rest of them too, the Magister twist was genius and all other characters were at least interesting if not fascinating. Plot: Beautifully spun and superbly paced, and it’s rare for me to feel that way. All elements were woven together with grace and great skill, the action, the romantic tension, the character development, everything was superbly done for me. This is like the golden formula of beautiful reading for me. Writing: Genius, I loved it with great and bubbly passion. Beautiful steampunk-mode style, the characters had the impressive language they ought to have in the setting, great references. Just superb. Though I’m tempted to do a full review, I’m the middle of a read-a-thon here so I did the quick review instead. Read this, you’ll love it! It’s freaking brilliant!! I had an ebook copy of this, but at the last minute I found out a friend of mine had a hardcover version of it, so I borrowed her copy to read it instead of my ebook. YAY! You finished. I still need to do that, but Imma get on it tomorrow!!! I have a concert to perform tonight :).